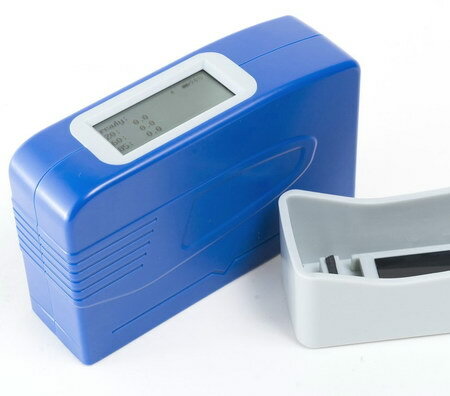 ETB-60G Gloss meter is the most portable model which is developed in China lately. All the parameters of ETB-60G comply with the JJG696-2002 standard and it can be widely used for detecting the painting, spraying, ink, rubber, stone, paper, tile, enamel, metal, coating and so on. 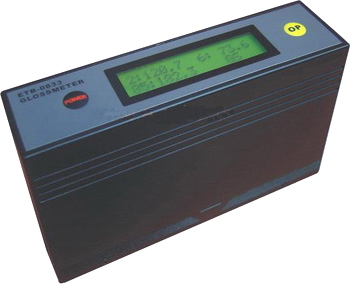 Easy operation and the battery can continuously works more than 40 hours which can approximately detect 10000 data. Particular damp proof process assures the instrument works under any terrible condition. Stable data and easy for fast detecting. Illumination with long service life. 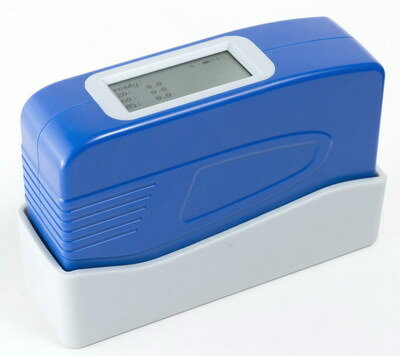 ∵The surface luster measure for printing ink, oil paint, bake lacquer, coat, woodwork and others. The technology parameter of ETB-1786 Gloss meter is complete according with state standard GB9754-88, GB9966.5 and international standard ISO2813, all items of the performance meet the first class work requirements of state JJG696-2002 (Lens Luster Degree Instrument Measure Test Regulations) . 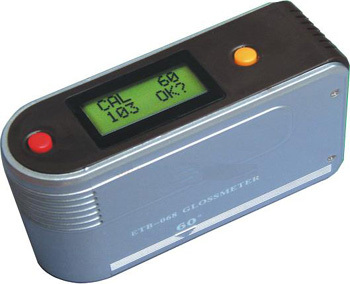 The technology parameter of ETB1783 Glossmeter is complete according with state standard GB9754-88, GB9966.5 and international standard ISO2813, all items of the performance meet the first class work requirements of state JJG696-2002 (Lens Luster Degree Instrument Measure Test Regulations) . Measurement of the surface gloss of all kinds of metallic and non-metallic materials and their coatings. of plastic moldings, Evaluation of detergents and washers, Checking masonry and washers, Checking building exteriors. Widely used in Floor maintenance, Surface cleaning quality control, Stone and tile gloss measurement, Checking printed matter, Quality control of paint and ink, Polished metal surface, measurement. * In accordance with international standard ASTMD523, ASTMD1455, ASTMC346, ASTMC584, ASTMD2457, DIN ENISO2813, DIN67530, ENISO7668, JISZ8741, MFT30064, TAPPIT480, GB9754, GB/T13891, GB7706 and GB8807. Its technical parameters conform with JJG696-2002. * Accurate measurement, good repetitiveness. * Small in size, easy to carry. * Intelligent design, rapid measurement. * Able to store 56 groups of measurements. * Can display gloss value of 20°, 60°, 85° at the same time. * Backlight display, suitable for low light environment. * 20°: High gloss paint, printing ink, plastics, paper and other materials. * 60°: Middle gloss paint, printing ink, plastics, ceramics, marble and other materials. * 85°: Low gloss paint, camouflage coatings materials. GB7706 and GB8807.Its technical parameters conform with JJG696-2002. * Automatic calibration. Small in size, easy to carry. * Intelligent design, rapid measurements. * Applies USB, Bluetooth data output. * Backlight display, suitable for lo light environment. 1. 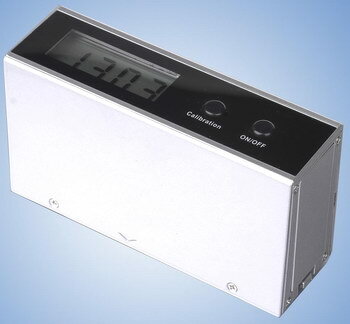 100% measured by the national superlative degree (in China), high accuracy to ensure that your measurements accurate. 2. Sophisticated design is more ergonomic, allowing you to use handy. 3. English operation interface, the operation is more simple and convenient. 4. The latest Bluetooth, USB and removable storage cards allow you to exchange data more convenient. 4. Three gloss angle data also showed that meet your data needs under the sheen. 5. The latest Bluetooth, USB and removable storage cards allow you to exchange data more convenient. 6. Dedicated software can help you gloss for data analysis and output. This gloss meter is designed and manufactured with the reference to the international standard ISO 2813 and China national standard GB/T9754. Technical parameters are in accordance with ASTM D2457, ASTM D523 and GB/T13891, GB/T7706, GB/T8807 standard. All performance indexes meet the primary working machine requirements of metrological verification procedures of national standard JJG696-2002 "mirror gloss meter and gloss board". Apply on paint, ink, stoving varnish, coating, wood products; Marble, granite, vitrified polished tile, pottery brick and porcelain; Plastic, paper; Other nonmetallic material. Apply on paint, ink, stoving varnish, coating, wood products; Marble, granite, vitrified polished tile, pottery brick and porcelain; Plastic, printing, paper; Other metallic material. JJG696 standard, adopt long life light source, good repeatability, small volume, high precision and good stability. (1) One button to complete measurement: one operation can complete measurement; Measuring light incident angle meet ISO 2813 three measuring light incident angle. ETB6-WG2 gloss meter is produced according to the national verification regulation of JJG696 standard, adopt long life light source, good repeatability, small volume, high precision and good stability. It is mainly used on coatings, printing ink, paint, paint, wood, marble, granite, polishing brick, brick of pottery and porcelain, plastic, paper, metal and non-metallic materials. ETB6-WG2 is an upgraded model, more stable performance, more durable, more comfortable. (1)One button to complete measurement: one operation can complete measurement; Measuring light incident angle meet ISO 2813 three measuring light incident angle. 1. 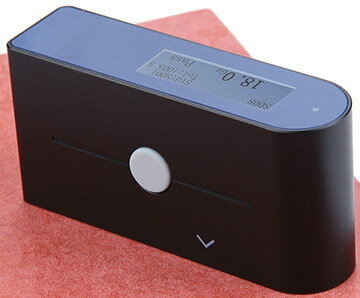 The delicate and light appearance is very convenient to carry and use. 2. Automatic calibration, no need to manual adjustment, high stability, namely the boot measurement. 3. All intelligent design, single bond operation, one hand can realize all operations. 5. LCD digital display, showing clear. 7. Feature-rich, measuring accuracy, good repeatability, cost effectiveness. 8. With small measuring spot, specially for hook face, cambered surface. 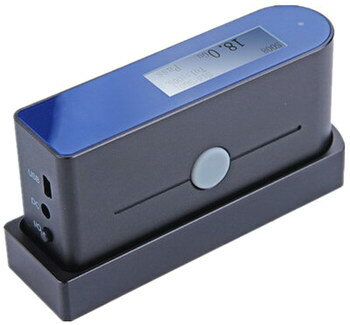 ETB268-WG gloss meter is produced according to the national verification regulation of JJG696 standard, adopt long life light source, good repeatability, small volume, high precision and good stability. It is mainly used coatings, printing ink, paint, paint, wood, marble, granite, bo to change polishing brick, brick of pottery and porcelain, plastic, paper, metal and non-metallic materials to the surface of the mirror gloss measurement. ETB268-WG is an upgraded model, more stable performance, more durable, more comfortable. 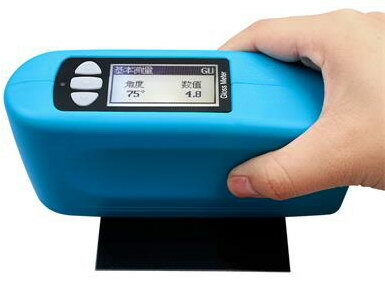 ETB4-WG gloss meter is produced according to the national verification regulation of JJG696 standard, adopt long life light source, good repeatability, small volume, high precision and good stability. It is mainly used on film material. ETB7-WG gloss meter is produced according to the national verification regulation of JJG696 standard, adopt long life light source, good repeatability, small volume, high precision and good stability. It is mainly used on paper material. 1. Standard: ISO2813, ASTMD1455, GB9754 and GB8807. 3. Streamline form design appearance. general type, don't need Zero calibration, data hold, packing with code case. Guaranteed for one year and repaired for ever. Technical support on the gloss measurement. Customizing any gloss meter for a special application. Guaranteed for a year and repaired for ever. 1, What surface gloss you/your customer want to check? There are two kinds as non-metallic or metallic surface. 2, What angle they need? There are two kinds as 60 degree or 20, 60, 85 degrees combined in one meter. 3, Do your customer need analyze the data on computer? There are two kinds as can't connect with computer or can connect with computer. 4, What measuring range they need? Different model has different measuring range. Knowing above 4 points, then you can choose the correct model from above models. Special Noting: 1, ETB-0686 is an economical model, the most competitive at price. It is also very popular using on automotive/car painting glossiness testing, for simple testing. However, all our models can be used for automotive/car painting glossiness testing. Special Noting: 2, ETB6- series are high level/professional ones, so with a little higher prices. Special Noting: 3, ETB-0833, ETB6-268, ETB268-H2, ETB268-F2 are models of 20, 60, 85 degrees combined in one meter. Other models are single 60 degree or two angle. Special Noting: 4, ETB6-GM, ETB6-GM2, ETB6-H2, ETB268-H2, ETB6-SM, ETB268-F2 are not only for metal surface glossiness testing, but also for non-metallic glossiness; other models are for non-metallic glossiness only. Special Noting: 6, Different angle/degree mainly for different application. 20 degree for high gloss, 60 degree for medium/semi gloss, 85 degree for low gloss. 60 degree is the most popular ones for most application. For your reference, here below table. 2. What difference in gloss units is visible to the human eye? 4. How is Gloss Measured? Gloss is the attribute of surfaces that causes them to have shiny or lustrous, metallic or mat appearances. A smooth and highly polished surfaces reflect images distinctly. The incident light is directly reflected on the surface, i.e. only in the main direction of reflection. The angle of incidence is equal to the angle of reflection. The more uniform the light is scattered, the less intense is the reflection in the main direction and the duller the surface will appear. One Gloss meter does double work. On very rough surfaces the light is diffusely scattered in all directions. The image forming qualities are much diminished: A reflected object no longer appears brilliant, but almost non-existent. 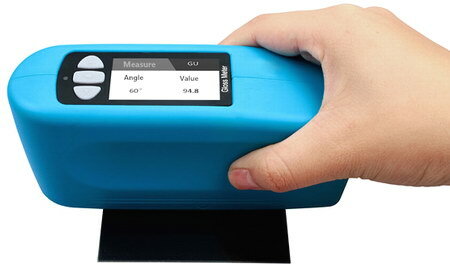 When one requires measuring all three types of surfaces described above, we 3 angle gloss meters that simultaneously measures all three geometries. 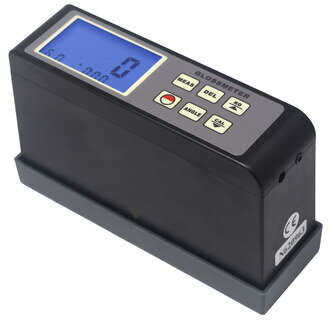 Our gloss meter incorporates all the technological advances into one unit offering a unique package in an economical package. 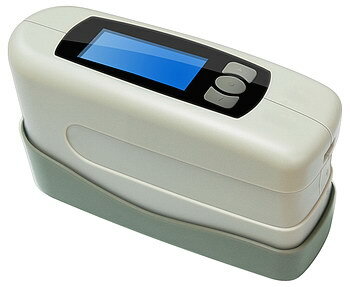 The micro-tri-gloss µ has everything you require in one compact gloss and coating thickness meter. 2) What difference in gloss units is visible to the human eye? Gloss is an aspect of the visual perception of objects that is as important as colour when considering the psychological impact of products on a consumer. It has been defined as the attribute of surfaces that causes them to have shiny or lustrous, metallic appearance. The gloss of a surface can be greatly influenced by a number of factors, for example the smoothness achieved during polishing, the amount and type of coating applied or the quality of the substrate. Manufacturers design their products to have maximum appeal- highly reflective car body panels, gloss magazine covers or satin black designer furniture. It is important therefore that gloss levels are achieved consistently on every product or across different batches of products. Gloss can also be a measure of quality of a surface, for instance a drop in the gloss of a coated surface may indicate problems with its cure- leading to other failures such as poor adhesion or lack of protection for the coated surface. Gloss is measured by shining a known amount of light at a surface and quantifying the reflectance. The angle of the light and the method by which the reflectance is measured are determined by the surface. Gloss is determined using a Gloss Meter which directs a light at a specific angle to the test surface and simultaneously measures the amount of reflection. The type of surface to be measured determines the gloss meter angle to be used and thus the gloss meter model. The intensity is dependent on the material and the angle of illumination. In case of nonmetals (coatings, plastics) the amount of reflected light increases with the increase of the illumination angle. The remaining illuminated light penetrates the material and is absorbed or diffusely scattered dependent on the color. 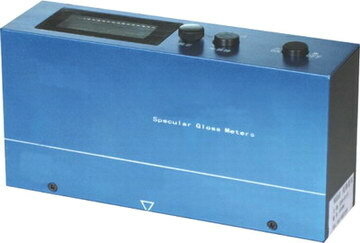 A glossmeter measures specular reflection. The light intensity is registered over a small range of a pre-defined reflection angle. Metals have a much higher reflection and are less angle dependent than non metals. Metals have a much higher reflection and are less angle dependent than non metals. The measurement results of a glossmeter are related to the amount of reflected light from a black glass standard with a defined refractive index, and not to the amount of incident light. The measurement value for this defined standard is equal to 100 gloss units. Materials with a higher refractive index can have a measurement value above 100 gloss units (GU), e.g. films. In case of transparent materials the measurement value can be increased due to multiple reflections in the bulk of the material. Due to the high reflection capabilities of metals values of up to 2000 GU can be reached. For these applications it is common to document the measurement results in % reflection of the illuminated light. Glossmeters and their handling procedures had to be internationally specified to allow comparison of measurement values. The angle of illumination is of high influence. In order to obtain a clear differentiation over the complete measurement range from high gloss to matte, 3 different geometries, i.e. 3 different ranges, were defined using a 60° gloss meter. In addition, there are industry specific applications for 45° and 75° measurement geometry. In this case study, 13 samples were visually ranked from matte to high gloss and measured with the 3 specified geometries. In the steep slopes of the curves the differences between the samples can be clearly measured, while in the flat part the measurement geometry no longer correlates with the visual. Gloss measurement for any application, whether you are dealing with specific applications or need a universal solution from high luster to a matte gloss sample or a small curved surface, ShowRange can help through their knowledge and complete line of solutions. 3. Gloss Meter Selection by Industry. ISO 2813 and ASTM D523 (the most commonly used standards) describe three measurement angles for the measurement of gloss across surfaces of all levels. The standard gloss unit (GU) is used; this is traceable to standards held at BAM (Germany), NRC (Canada) or NPL (UK). All gloss levels can be measured using the standard measurement angle of 60 degree. This is used as the reference angle with the complimentary angles of 85º and 20º often used for low and high gloss levels respectively. For improved resolution of low gloss, the 85 degree angle is recommended for surfaces which measure less than 10 GU when measured at 60 degree. This angle also has a larger measurement spot which will average out differences in the gloss of textured or slightly uneven surfaces. The acute measurement angle of 20 degree gives improved resolution for high gloss surfaces. Surfaces that measure 70 GU and above at the standard angle of 60 degree are often measured with the 20 degree geometry. High glossy surfaces can be affected by another characteristic called, “Haze”. Thus the 20 degree angle measurement is more sensitive to haze effects. These affect the appearance of a surface. 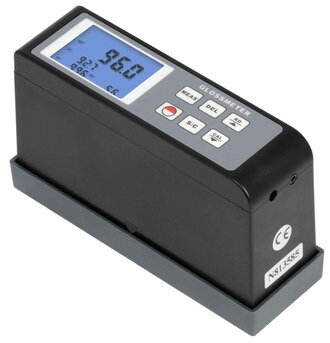 The curve gloss meter resolves the gloss differences across holograms and the polish on coins, steering wheels and extruded pipe work. 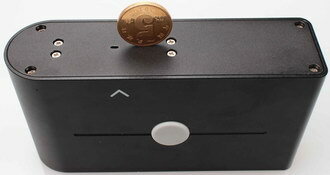 The curve gloss meter has a very small measurement spot of 2mm. 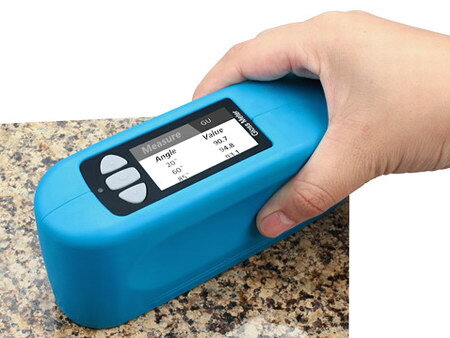 When irregular or textured surfaces are measured, the small measurement area can give different gloss values compared to a standard meter that has larger measurement area. To produce comparable results, take 10 measurements on the Curved Surface Gloss Meter and use the statistic function to calculate the average reading. All standard gloss meters are designed for flat surfaces, if they are used on a curved surface, the measurement beam is reflected away from the instrument detector resulting in incorrect readings. The solution to this problem is to using a very small area. The light is slightly scattered by the curved surface, however as long as the reflected beam remains sufficiently narrow to remain within the instrument detector the reading will be correct. The Curve with Jig Gloss Meter is specified for measuring cylinders and spheres with very low diameters. The Curve with Jig Gloss Meter was developed in conjunction with the National Physics Laboratory (NPL). Now you should know which angle is appropriate for your application and industry. We have a selection grid for you to choose from. Single angle instruments are available in each of the measurement geometries (20/60 and 85 degree). Dual Angle instruments give improved performance for medium to high gloss applications with a geometry of 20 degree and 60 degree in one unit. Triple angle instruments have an additional geometry; the 85 degree geometry for improved resolution on low gloss surfaces offering you the 20/60/85 degree. 60 - Universal measurement geometry. Measure any surface from ultra matt to mirror finish. 20 - Improved measurement on high gloss (>70GU @60) e.g. plastics, coatings and polished metals. 20 - improved measurement of high gloss levels. 60 - universal measurement angle. 85 - improved resolution on matt surfaces. Many industries measure gloss to ensure the quality of their products. It has been shown that the gloss level of a product has as much psychological impact on a consumer as its color. Many products are designed with combinations of high gloss and matt finishes, maximizing their customer appeal. Surface quality can often be assessed by measuring gloss. For example poorly cured paints or coatings can exhibit unusual gloss levels and can lead to chipping and flaking at a later stage in manufacture. ShowRange has gloss meters in single, dual and triple angle format, making www.china-total.com the company with the largest range of Gloss Meters with the most comprehensive range of instruments on the market today. The car industry invests in delivering products with gloss levels that have maximum appeal to end customers. Gloss levels vary from mirror finish chrome parts to very matt “soft touch” internal plastics. High gloss finish paints for bodywork are controlled for gloss using the 20 degree angle. Mid-gloss plastic and wood finishes are controlled using the 60 degree geometry and matt interior plastics using the 85 degree. Curved parts such as steering wheels, exhausts, chromed fittings and switches are measured using the Curve Gloss Meter. Most paints and coatings are gloss controlled from formulation, checked regularly during manufacture and finally during application. Changes in gloss levels in the process can lead to substantial visual differences in batches offered to the end user. Closely controlling gloss means maximum visual impact and rejections are avoided. The protective coatings industry monitors gloss during the lifetime of a coating because as the paint ages its gloss level drops. When it reaches a preset level the structure is re-painted ensuring that a maximum lifespan is achieved from the coating without the risk of corroding the structure it protects. Paints and coatings are primarily controlled using the 60º degree angle geometry, with the additional 20º and 85º geometries for high gloss and matt coatings. Furniture can be painted, coated, varnished or stained to any gloss level from very matt to the highest gloss. Throughout this process it is necessary to control the gloss of the products for batch consistency and to check that the coating has been applied and is drying correctly. The 60º geometry is standard in the furniture industry with some customers also specifying the additional 20º and 85º angles. Large coated surfaces can be checked for gloss variations in seconds using the "Continuous Read" feature which is standard in every ShowRange Gloss meter. The plastic industry manufactures products of all shapes and sizes needing gloss measurement. Small gloss differences in these products can lead to rejections by customers and can be an indication of problems in the manufacturing process or the quality of the raw plastic material. Extruded pipe work is controlled using the Curve with Jig Gloss Meter which is designed for curved surfaces. Small injection molded parts, such as PDA or mobile phone parts are often curved or have an area that is too small to be measured with traditional gloss meters. The Curve Gloss Meter is used for these components. Metallic parts and products are often plated, finished with a protective coating or polished to make them attractive to the end user or as a functional protection from corrosion or wear. Gloss is often used as a quality control measure. The 60 degree and 20 degree glossmeters are used to check the finish on flat plated and polished metals. The Curve Gloss Meter is also used for the polish of stainless steel pipe and for small surfaces are such as gold plated pen nibs or metal watch bracelets. Natural stone is processed to produce items with many finishes dependent on their end use. Marble and similar materials are polished to produce high gloss surfaces where other stone is left rough and matt in appearance. Glossmeters are used to ensure batches of stone products match visually and to optimize the amount of finishing is consistently applied to each surface. The three angles of our 20/60/85 degree gloss meter give maximum flexibility on both matt and high gloss stone finishes. Gloss is an indispensable measure in the printing industry. Packaging and magazine covers are regularly UV varnished for a quality glossy appeal to consumers and company brochures are given that professional edge with lamination and varnish to give contrasting matt and gloss effects. By monitoring the gloss of the UV varnish these problems can be avoided. The gloss variation across a large printed sheet can be assessed in seconds using the continuous read feature on our gloss meters. The gloss of paper is often quantified using a 75° glossmeter.